Integrated flip down front handle. 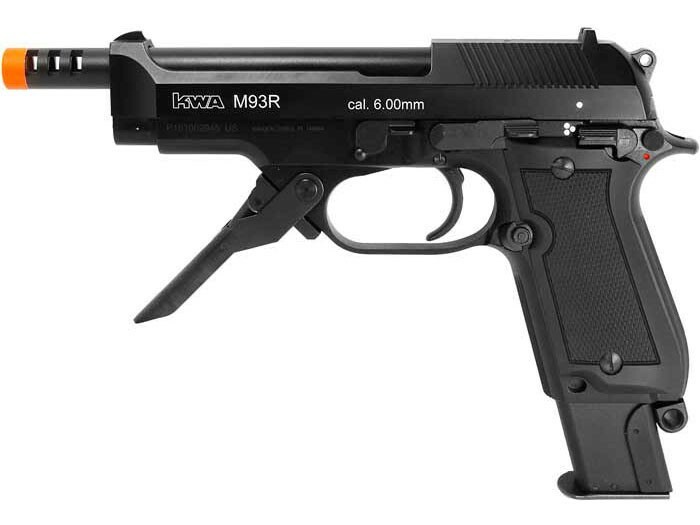 Brace yourself for battle with the KWA M93R NS2 Gas Pistol . 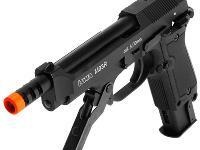 This awesome airsoft gun has the look, attitude, and powerful shot velocities that will stun competitors in the battlefield. 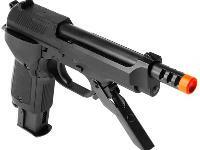 The pistol is powered by KWA's revolutionary new NS2 gas delivery system. The internal expansion chamber of this system delivers gas more efficiently than other gas delivery units. 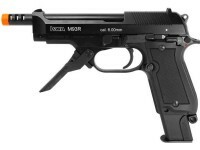 The gun features a metal alloy slide, a 32 Rd magazine, and a shot velocity of 350 fps (using .20g BBs). 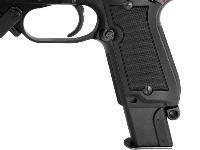 The pistol also features an integrated flip down front handle, and an adjustable hop-up unit also allows airgunners to adjust the accuracy and performance of the gun. For unbelievable accuracy and crisp blowback firing this gun can't be beat. 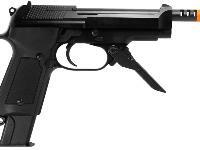 The KWA M93R NS2 Gas Pistol comes with Hop-Up adjustment wrench, and package of Airsoft BBs. 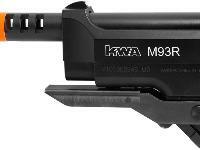 Things I liked: Another very fine quality pistol put out by KWA. Looks and feels great in the hand with plenty of heft, weight, and ballance. Really like the idea of the three firing modes, semiauto, three round burst, and fullauto, witch is in the middle between semi and 3 round, Its not marked but it is there. 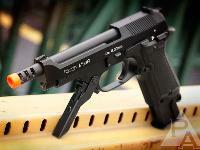 This pistol is pure awesome and fun to shoot. 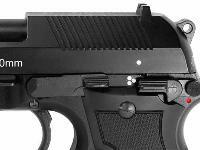 Fold down handle at the front of the trigger guard is a great idea so it makes it easy to control it in fullauto mode. 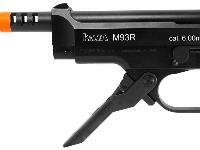 Has a crisp blowback and easy trigger pull. Sights line up quick and easy with very little effort. Things I would have changed: Make the fold down handle at the front of the trigger guard more rounded instead of a square type of channeled metal. It would make it more comfortable on the hand and fingers. What others should know: Buy extra magzines as well as extra gas and ammunition. You'll go through the gas and ammunition pretty fast. It is that mutch fun to shoot. Things I liked: I like the balance, the sturdy frame, the rapid three shot burst and the two clips. It is very well made. Very nice looking gun. Things I would have changed: Make one in C02. What others should know: I would get the adapter for the propane fill. Read and follow instructions sent with gun before operating. Get lots of bbs, you're going to love shooting this gun. As always a hats off to Pyramyd crew for prompt delivery. Will, I got the extra clip and the folding stock attachment. It cost a few dollars more but worth it. What comes with this gun. Things I liked: Well made, look and feel, rate of fire. What others should know: A little pricey, but what's not that is worth anything. One of the better pistols that I own.